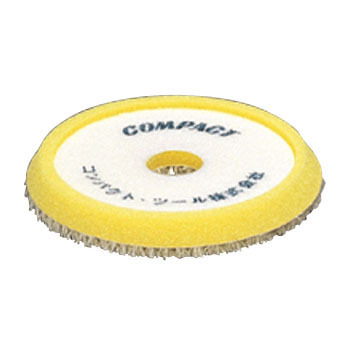 Ideal for polishing glass, easy to use with compatibility with abrasives. Somewhat hair falls out. This review is about item#10925591. It is repeat purchase. If you use it, the yellow part of the deaf comes to be reduced, but there is no particular problem in use. I use it multiple times. After all it seems that the white part and the yellow sponge part peel off a bit earlier .... I want a little more durability. Otherwise I would like you to make it cheaper a bit. Since it is just size for the polisher used, I think that I will purchase it in the future, but if there is something a little better, I will use that one. There is no chance that the yellow sponge part and the white part will peel off, but I want a little more durability ... usability is good.